As busy parents, sometimes it’s nice (and necessary) to take a break from the daily grind of life with kids in order to reconnect with your co-parenting partner. 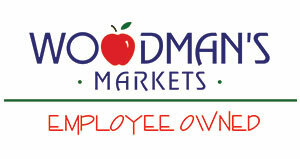 My husband and I are both craft beer enthusiasts and avid home brewers. Ok, HE'S the avid home brewer, but I am an avid supporter of his finished products. 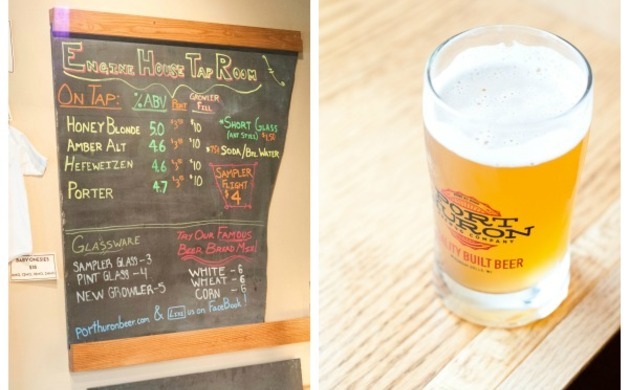 Since we’re fortunate enough to live in the great state of Wisconsin, where beer and cheese reign supreme, finding local breweries to taste and tour is easy and fun. We typically pack a picnic, load the kids in the car, and head off on hoppy adventures with the whole crew. However, solo trips without the kids are really special treats for us. On our most recent day date adventure, we decided to check out Port Huron Brewing Company in Wisconsin Dells. 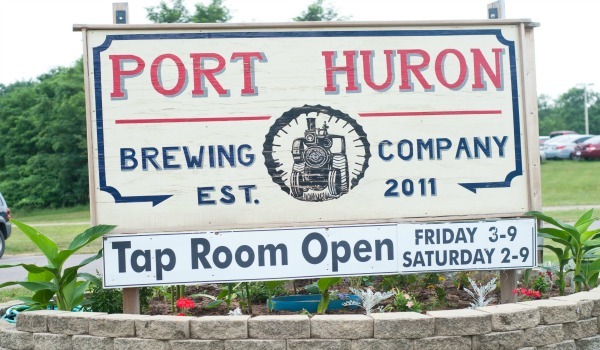 Located on the outskirts of The Dells, Port Huron Brewing Company is a family-owned brewery that’s been open since 2011. As soon as you walk through the door you’re greeted with warm colors, rich wooden accents, and a smiling face behind the bar. The tap room is small in size, but vibrant and full of life. Instantly, your senses are filled with laughter, clinking glasses, fresh popcorn, and cold beer. 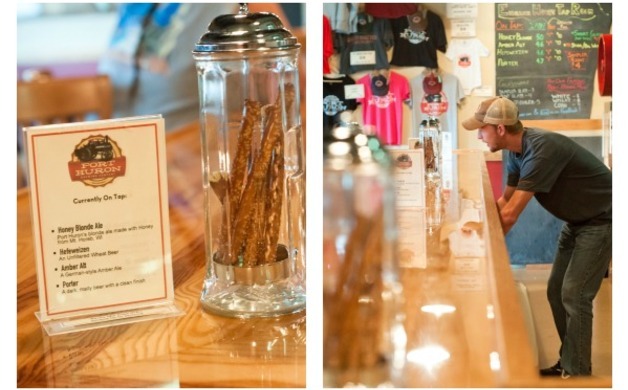 The bartenders are knowledgeable in all areas of the brewery; the history, equipment, hops, and the beers themselves. They offer a selection of four beers on tap at the moment: a refreshing Honey Blonde Ale, a traditional wheat Hefeweizen, a malty German style Amber Alt, and (my personal favorite) a dark and creamy Porter. You can purchase a pint and enjoy it in the tap room, or buy a growler and take home half a gallon of your favorite brew. 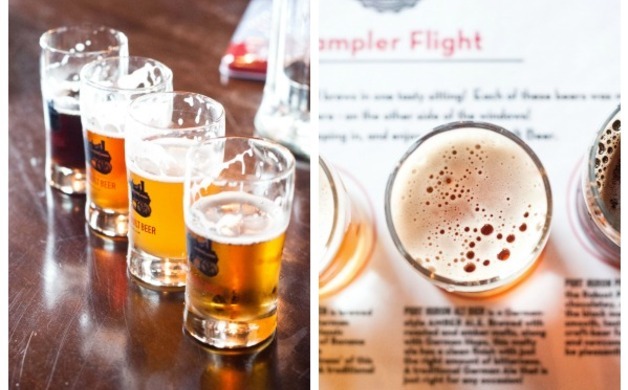 I highly recommend taking your taste buds on a ride and ordering the sampler flight! It’s the best way to try each of the beers before deciding on a pint. I recommend sharing a flight with your companion! Free popcorn and pretzels are at the ready for all patrons. This may seem like something insignificant, but anyone who regularly travels to breweries (and tap rooms) knows how awesome it is to have something to munch on while sampling beer. It’s also encouraged to bring food in (picnic style). Eat, Drink, and Be Merry at Port Huron Brewing Company! Tours are given on Fridays at 4pm and 6pm, and on Saturdays at 2:30pm and 4:30pm. For larger groups, I'd recommend calling ahead so they can best accommodate your group. *Check Out the brewery’s namesake Port Huron Steam Traction Engine, a steam-powered tractor, at the Badger Steam & Gas Engine Club’s annual Steam Show!